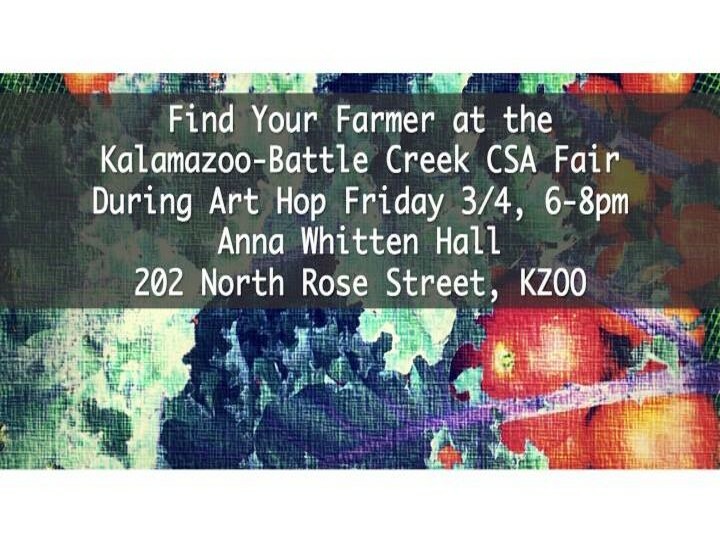 Michigan Farm To School - Blog: Kalamazoo/Battle Creek Area CSA Fair March 4! at the Kalamazoo/Battle Creek Area Community Supported Agriculture (CSA) Fair! 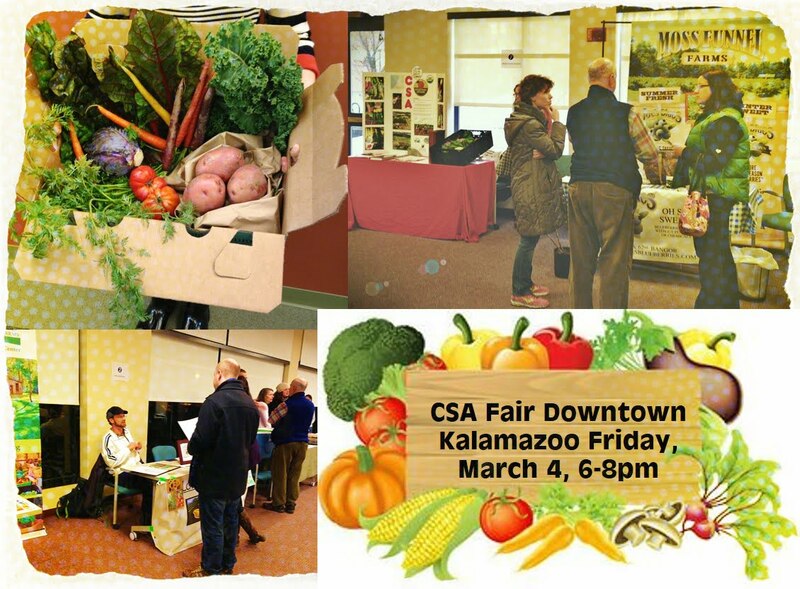 Michigan State University Extension is partnering with KVCC’s Bronson Healthy Living Campus to host a CSA Fair on Friday, March 4 from 6-8pm in the lobby of Anna Whitten Hall. CSA stands for “Community Supported Agriculture” and provides an opportunity to invest in a local farm by purchasing a share of its products at the beginning of the season and receiving regular portions of fresh food as it is harvested. This transaction helps the farm by providing income to cover operating expenses at a time of the year when cash flow is lower. CSAs come in different sizes, season lengths, styles, and options. 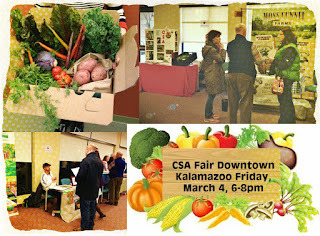 Kalamazoo Area CSA Fair attendees will have the opportunity to meet local farmers face-to-face, learn about CSA programs, and find out if a CSA is right for them. Participating farms have delivery or pickup sites in Kalamazoo, Battle Creek, Benton Harbor, Dowling, Galesburg, Lakeview, Marshall, Pennfield, Portage, Richland, and Texas Corners. A variety of CSA options are available for produce, meat, eggs and more. The list of farms that will be attending in person includes Agropraxis Farm at Tillers International, Bonamego Farms, DeLano Farms at the Kalamazoo Nature Center, EarthSmith Food & Forest Products, Green Gardens, Lake Village Homestead, Molter Family Orchards, Scobeys Produce, Soil Friends Farm and Sprout. Information on CSAs from Koelbel Farm and The Organic Gypsy will also be available for attendees. The fair is being held in conjunction with Art Hop and the KVCC Fretboard Festival at the Kalamazoo Valley Museum. . This is a free event and anyone is welcome to attend. An educator from Michigan State University Extension will be on hand with information on factors to consider when shopping for a CSA and ways to use and store your fresh Michigan produce.